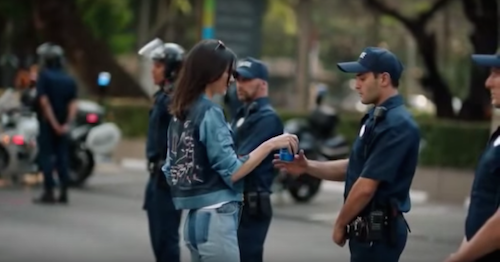 Pepsi faced a tidal wave of backlash after it released an advert starring Kendall Jenner as an impromptu protester who defuses tensions by handing a soda to a police officer. The soft-drink giant has pulled the ad and apologised for putting Jenner in an unenviable position. But if the 21-year-old model and Keeping Up with the Kardashians star had taken a moment to think about her middle name, she might have thought twice about appearing in the controversial spot. Kris Jenner named her daughter 'Kendall Nicole' after Nicole Brown Simpson, a friend who was brutally murdered in 1994, a year before Kendall was born. Nicole's husband, football legend and movie star OJ Simpson, was accused of her murder - his 'trial of the century' has spawned an Oscar-winning ESPN documentary and a FX true-crime series in the past year alone. Robert Kardashian, one of Simpson's close friends and a member of his defence team, was married to Kris Jenner until 1991. Given her family's ties to Robert Kardashian and her namesake, Kendall must be familiar with OJ Simpson's trial. She must also know about the police beatings and riots in Los Angeles that served as a backdrop to the case, framing it as a racist police force and city government conspiring to defame one of the first African-Americans to become a sports hero and mainstream celebrity. Growing up, she would have heard stories of the seriousness of riots and unrest, and tales of the strained, often violent relationship between police and protestors. As a member of a family that is acutely aware of the interplay between privilege, prejudice and violence, Kendall should have realised that "co-opting the resistance to sell soda" was a tone-deaf decision that diminished the concerns of actual protestors. She could also have guessed it would be bad for business, as walking out of a photoshoot, tossing her coat to a black assistant, joining the masses on a whim and defusing the conflict with a soda indicates that she's fundamentally out of touch with fellow millennials. Pepsi's marketing team came up with the ad's concept and should carry the bulk of the blame. But Kendall could have been a voice of reason in the room, warning that it would be unwise to downplay injustices and make light of resistance and protest. Simply remembering the tragic death of her namesake, and the incidents of corruption, police brutality and racism that coloured the subsequent trial, might have given her pause.